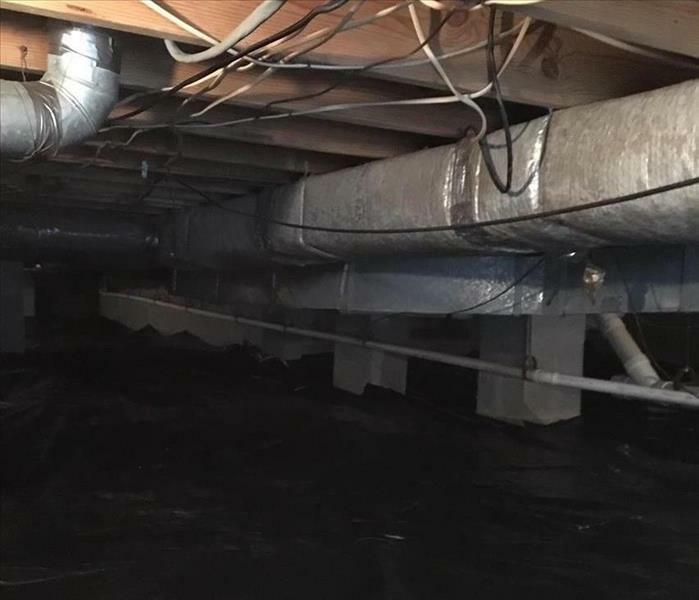 When the crawlspace under your home has water damage, many other problems such as a mold infestation can result. That is why you should trust our experienced IICRC certified team when water damage has occurred. Contact us 24/7 365 days a year for any emergencies. What do you do when your business has experienced a water loss incident? Call SERVPRO Franchise professionals. We know how important it is to keep your doors open and the business running. 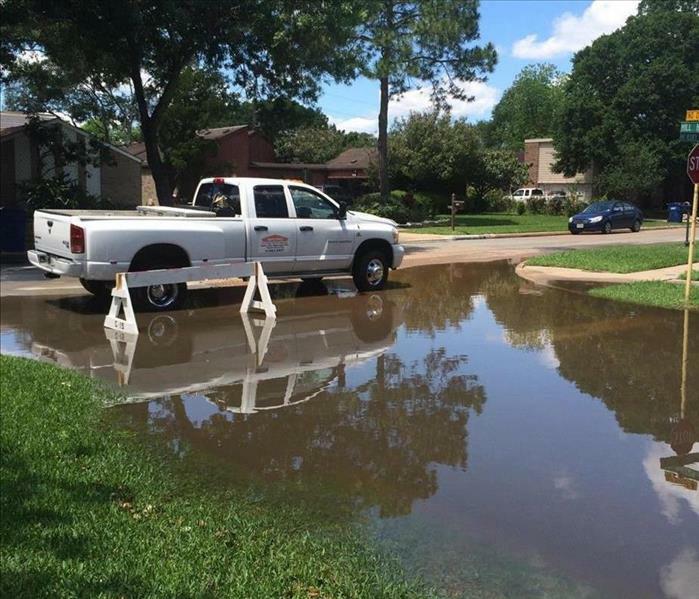 We have the technology, equipment, and expertise to remove the water with the least disruption to your business and make it "Like it never even happened." Sunny or rainy days and nights, our SERVPRO Franchise professionals are available 24/7 to tackle your water loss incident. Because we are local, we can arrive at your home quickly to begin drying our your property. You can trust the SERVPRO Brand for all of your water restoration needs. Franchise Owners, John & Kristina Greenway, presented Production Manager, Nick Lee, with the '2018 Employee of The Year' award. We are so proud of him and can't thank him enough for all the hard work he puts in every day. They also shared the story of the very first infrared camera they purchased for Kristina when they first started with the franchise many years ago. They have decided to pass it on to Operations Manager, Chuck Peterson, who was very reluctant to accept the expensive piece of equipment. Treat it well, Chuck! Storm damage left this Knoxville kitchen underwater. 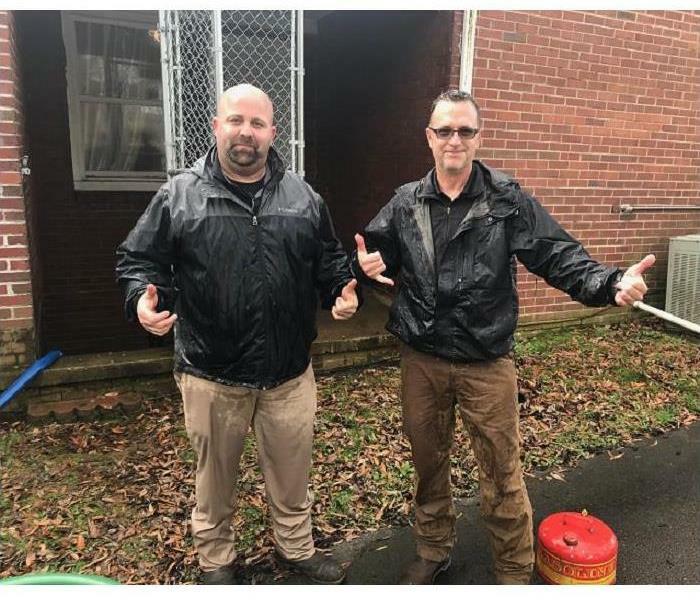 SERVPRO of Rocky Hill / Sequoyah Hills / South Knoxville has earned the reputation of “faster to any disaster.” Our rapid response times can prevent secondary water damage and help contain restoration costs. Our industry certified crews have the advanced training and experience to restore your property back to its preloss condition. WELCOME BACK!!! For the last 5 1/2 weeks, SERVPRO of Rocky Hill / Sequoyah Hills / South Knoxville has been in Wilmington, NC helping local residents recover from the devastation from Hurricane Florence. Wilmington was one of Florence's hardest hit areas. SERVPRO of Rocky Hill/Sequoyah Hills/ South Knoxville owner Kristen Greenway's motto is "Helping others in their time of need is one of life's greatest privileges," and we consider it an honor to help you. Whether the damage is small or large, our team is ready 24/7 to help you after disaster strikes. 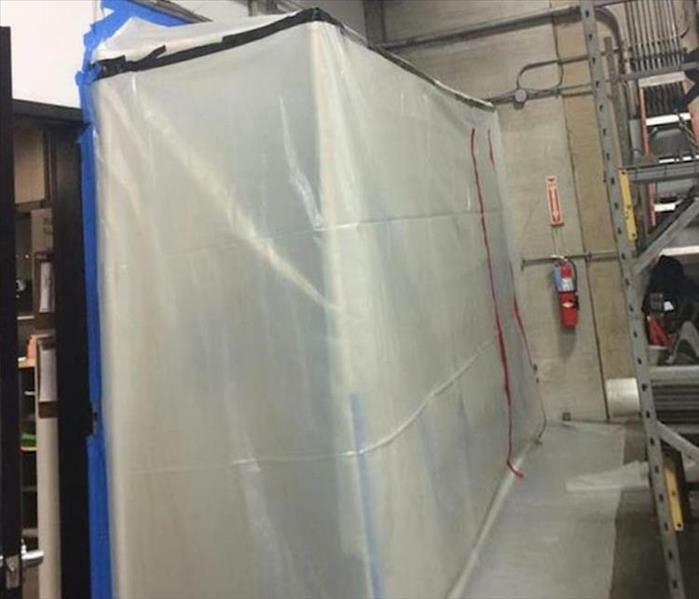 SERVPRO can quarantine mold infestations within fabrication plants in the Knoxville area. Our efforts prevent the cross-contamination of other elements within the factory while also allowing routine work to continue. We work so you can too. 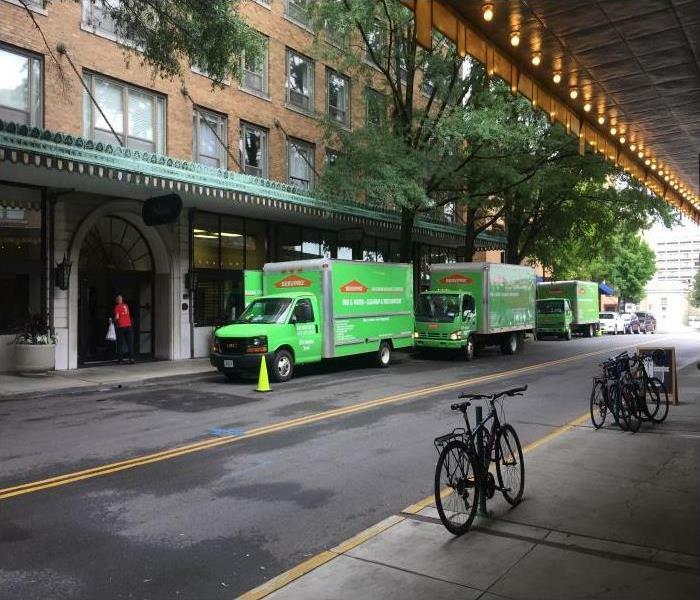 Our team at SERVPRO of Rocky Hill / Sequoyah Hills / South Knoxville responded to a water damage emergency at a five-story commercial property in downtown Knoxville. Since our crew is available 24/7, we were able to respond quickly and restore this property to pre-damage condition. Our experts made it "Like it never even happened." Between the charred fire-damaged insulation, the water from the extinguishing, and other debris, our SERVPRO crew worked to clean the attic and top floor room. Pictured is Donald McNair and his helper collecting the wet, contaminated material for suction and extraction using our insulation removal machine. This service was a 4-man operation to clean and disinfect the second and third-floor units. 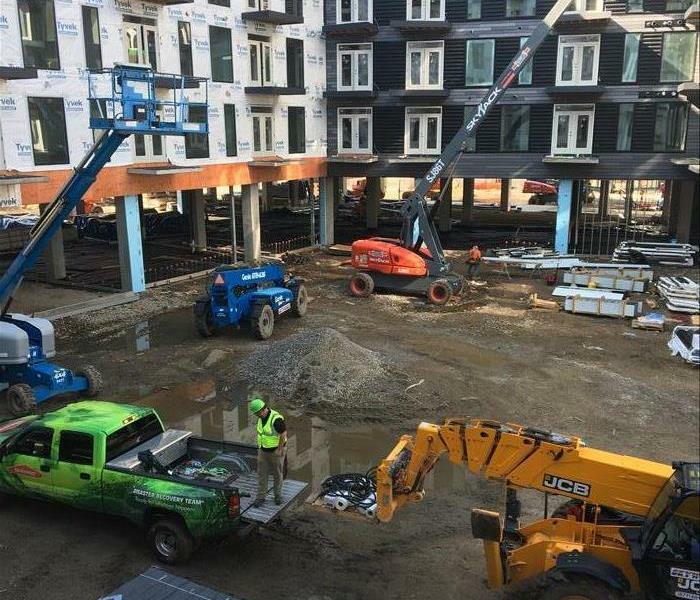 Our team responded to call about heavy rains causing significant damage to the exterior envelope of a building under construction. 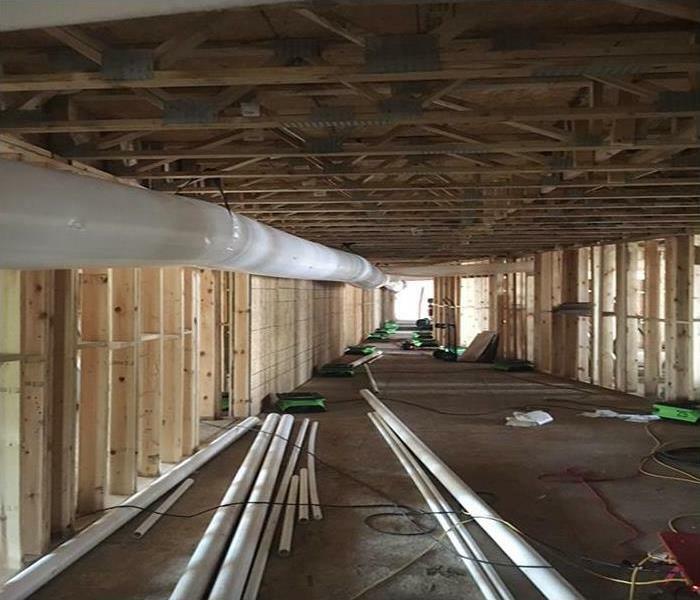 Our experts are using a commercial desiccant dehumidifiers and “lay-flat ducting.” “Lay-flat ducting” is a soft plastic tube that is flattened in a roll and is connected to the dehumidifiers with air moving through it as it inflates. The team at SERVPRO will work quickly and efficiently to restore this property to pre-damage condition. 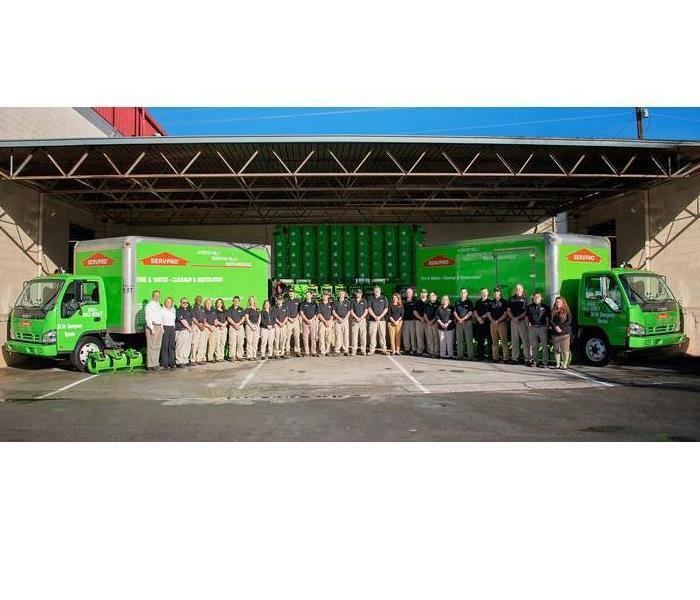 Our extensive and well-trained crew is a member of a SERVPRO Large Loss Response Unit, the best of the best. Led by Tim Visser, Nick Lee, and Cody Johnson we made a difference in mitigating the water damage at this sizable commercial complex in the Rocky Hill Area. Our Green Fleet transports Team Greenway, massive amounts of industry-leading extraction and drying equipment, formulated antimicrobial and other products, and a peer-less skillset to grapple with any commercial water damaging event. We're Faster To Any Size Disaster, just ask our clients. Our Large Loss Team is making a difference by restoring this property to pre-damage condition. 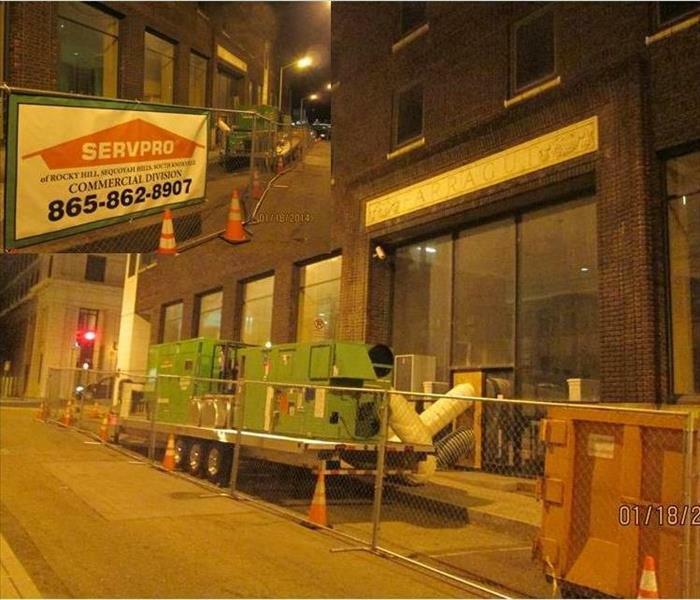 Our truck mounted generator and desiccant dehumidifier is on site to assist during the restoration process. If your commercial property experiences any damage you need to contact our team right away! 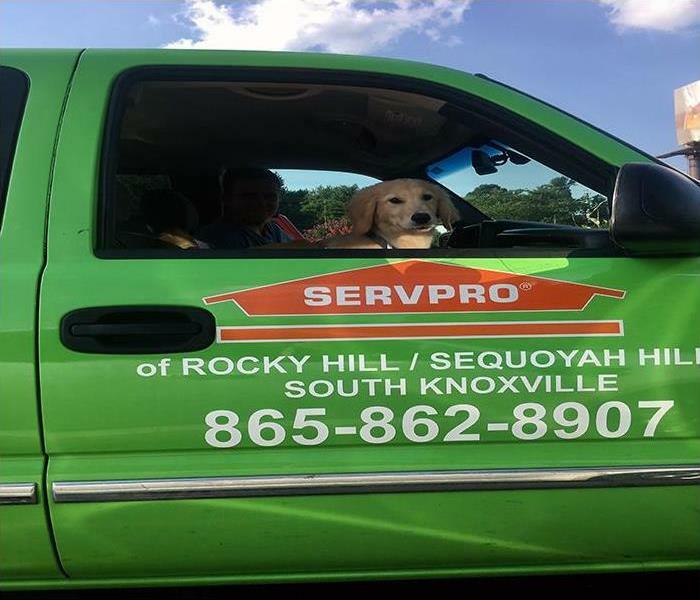 SERVPRO of Rocky Hill / Sequoyah Hills / South Knoxville is Faster to Any Size Disaster! Our storm team at SERVPRO of Rocky Hill / Sequoyah Hills / South Knoxville was preparing to head out to Roanoke, Virginia. Our team is helping fellow franchises in Roanoke with recent flooding. We hope our team arrives safe and can help the state of Virginia! Fire damage at Knoxville commercial or residential properties leaves behind very unpleasant odors long after the fire has been extinguished. 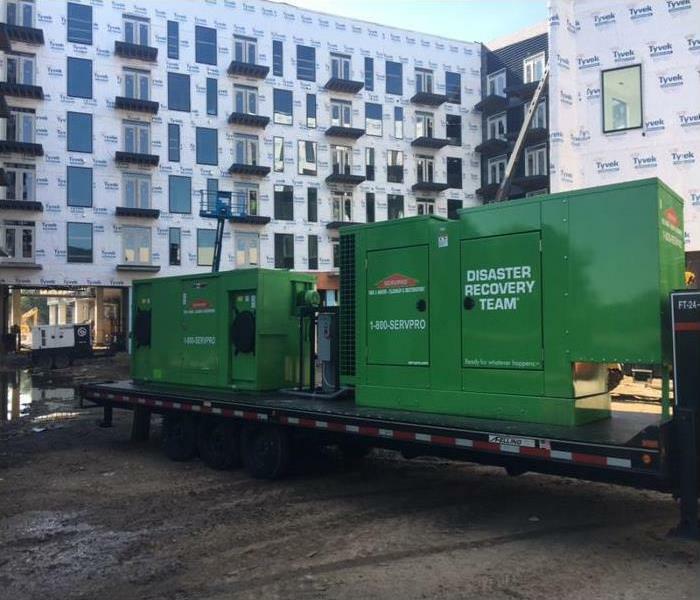 Pictured is a hydroxyl generator that SERVPRO of Rocky Hill / Sequoyah Hills / South Knoxville utilizes to reduce the smell left after a fire is gone. 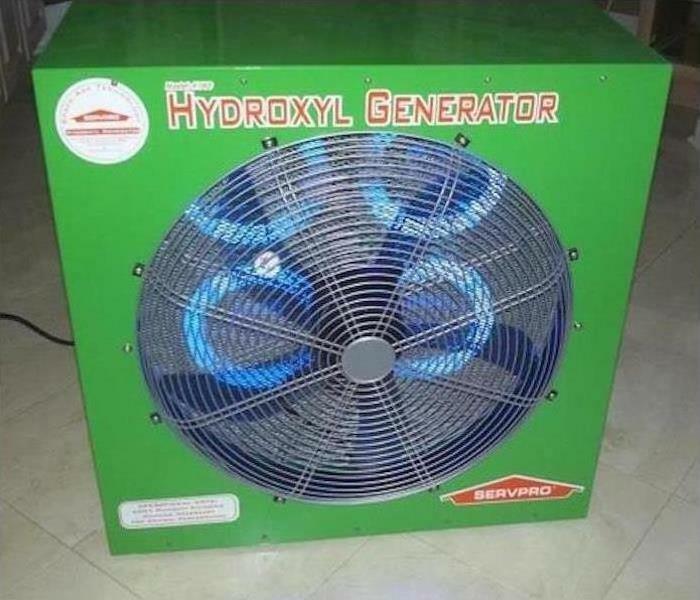 The advantage of hydroxyl generators is that they do not employ any ozone. Thus the residents or occupants of the structure can remain in the building while the equipment is in use. 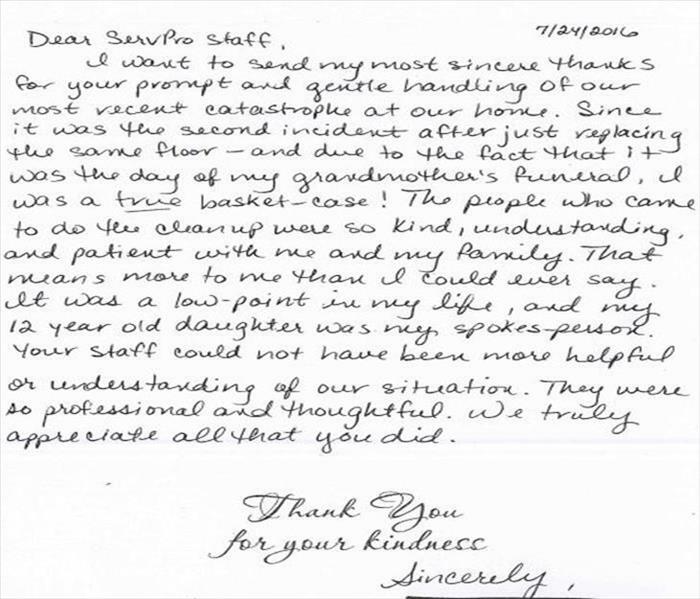 Our team recently received a thank you note from one of our wonderful customers. The note reads “Hi! 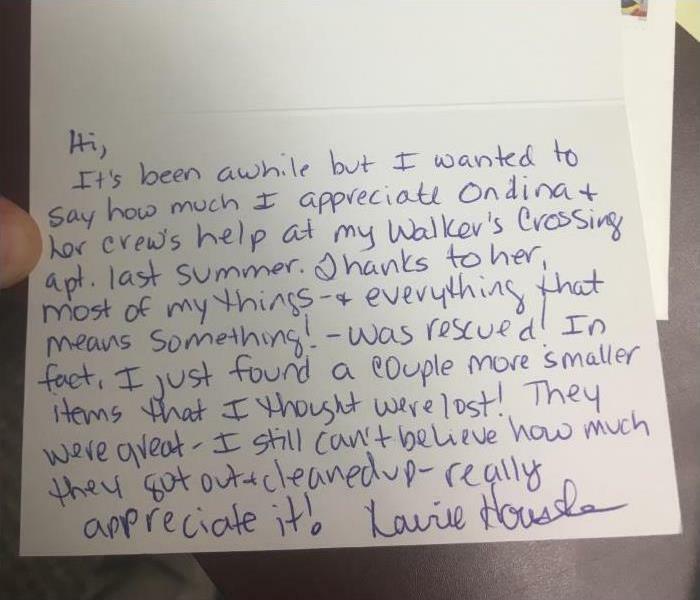 It’s been awhile, but I wanted to say how much I appreciated Ondina & her crew’s help at my Walkers Crossing apartment last summer. Thanks to her, most of my things, and everything that means something was rescued. In fact, I just found a couple more smaller items that I thought were lost. They were great. I still can’t believe how much they got out & cleaned up. I really appreciate it.” We appreciate our customers and love hearing feed back. 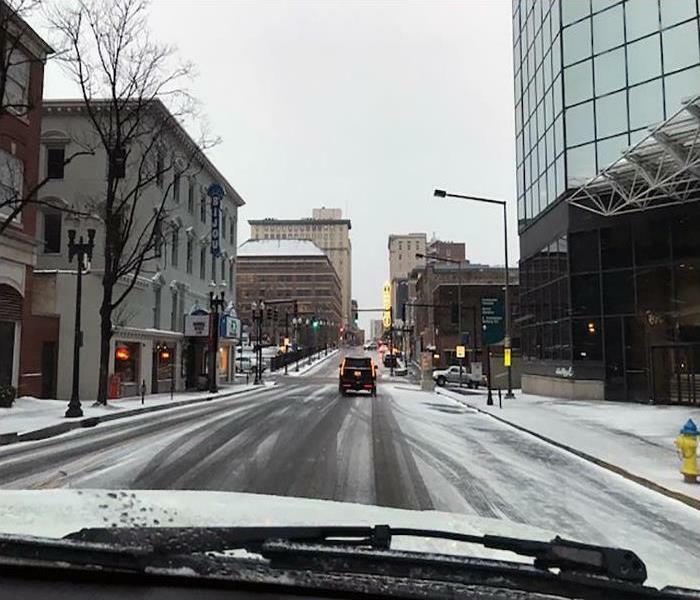 Knoxville is experiencing some snow and freezing temperatures. The low temperatures can cause your pipes to freeze and burst creating a water damage emergency. You need to contact the experts at SERVPRO of Rocky Hill / Sequoyah Hills / South Knoxville for assistance. Water damage to your commercial or residential property will be repaired and restored by our team of highly trained technicians. We Are Ready and Here To Help! 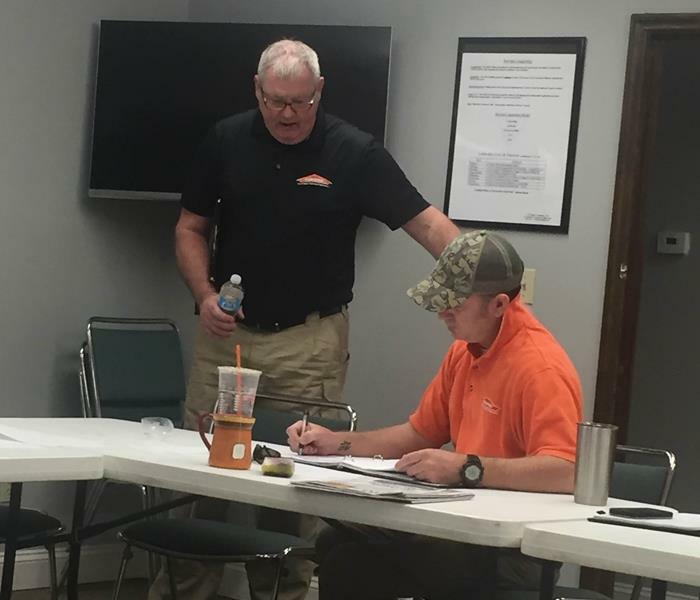 Pictured is SERVPRO of Rocky Hill / Sequoyah Hills / South Knoxville team member, Chuck Peterson, coordinating the team prior to starting a commercial water loss project. Our local crews have the training and equipment to respond quickly to large commercial water damage emergencies. Whether your water emergency occurs due to a frozen water pipe or winter storm, our experienced team will have your Knoxville area business back up and running in no time. Water damage extended to three separate floors of this downtown Knoxville hotel when a pipe burst. SERVPRO of Rocky Hill - Sequoyah Hills - South Knoxville was contacted to provide the water damage clean up that was necessary. The extent of the water damage required significant material resources and the trained crews to operate. We were prepared on all fronts. 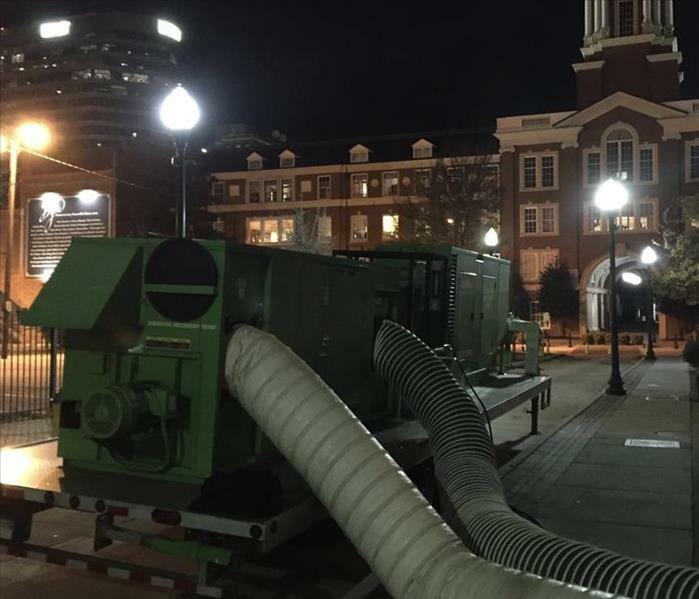 SERVPRO Rocky Hill/Sequoyah Hills/South Knoxville has a Large Scale Desiccant Dehumidifier at work in Downtown Knoxville, to dry a commercial building after a fire and water loss. 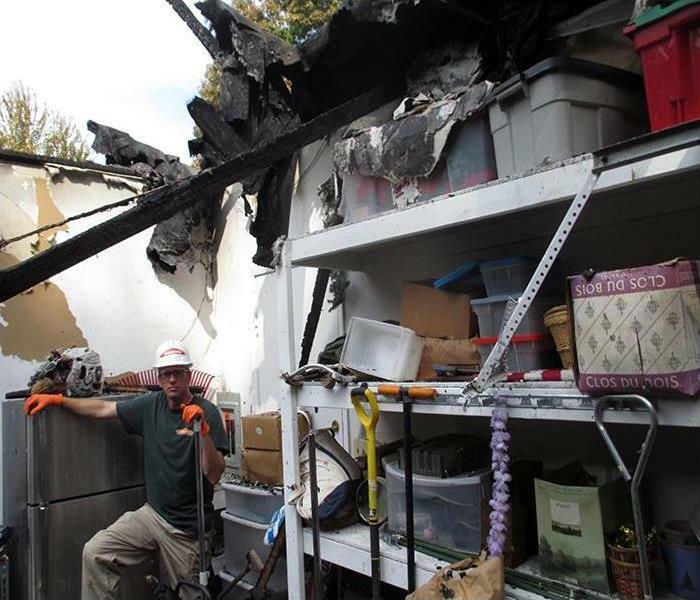 It’s all part of being the only Large Loss Restoration Team within 100 miles of Knoxville. We are pleased to provide the skill, experience, and help to Commercial Property Managers and Commercial Property Owners. We’re happy to assist our friends in the Commercial Insurance Industry. We recently responded to a fire damage incident at a property in Downtown Knoxville. Wiring within the walls malfunctioned and caused a fire. The property also suffered significant water damage due to the sprinkler system. We needed to act fast to help employees pack up their belongings and get them out of their offices so our technicians could begin the restoration process. The customers were glad to know that SERVPRO was on the scene. Our team at SERVPRO will work quickly and efficiently to restore this property to pre-damage condition. 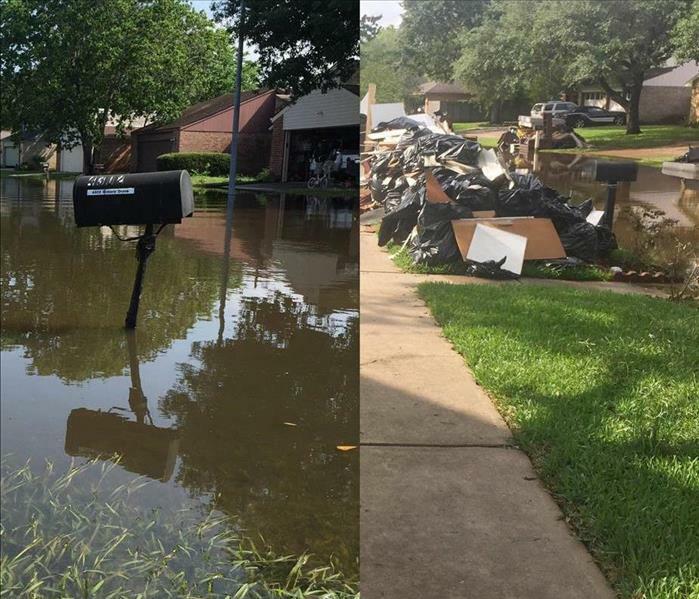 This neighborhood street in a Texas suburb was inundated from Hurricane Harvey. As devastating as the water level still is, observe how much the storm waters have already receded by the line on the picket fence. Can you image the havoc to property and possessions from this natural disaster? SERVPRO can. We dispatched out a large crew and equipment to assist in the recovery. We are available 24/7 to respond to emergencies, even many hundreds of miles away from our home base. Count on us, Team Greenway with our Green Fleet from drying out a carpet to extracting enormous volumes of water from homes and businesses. Team Greenway is still working hard in Houston helping those affected by the aftermath of Hurricane Harvey. When a flood or storm hits your Knoxville area home, you need the team with storm damage experience. 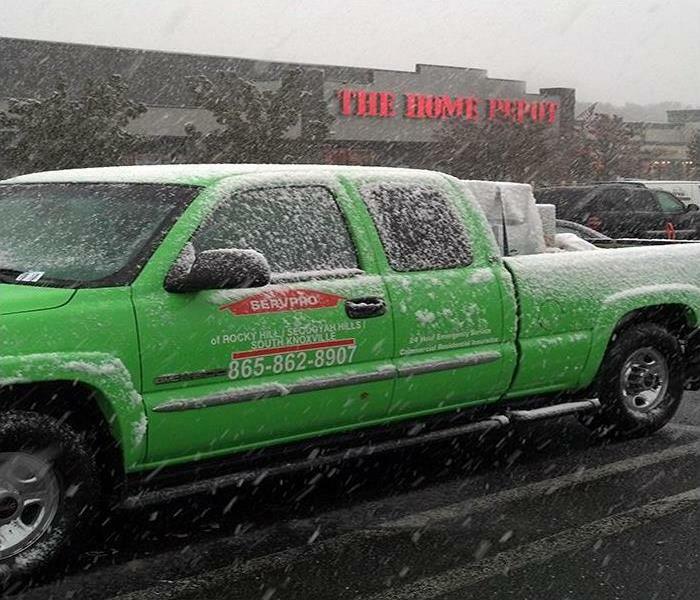 SERVPRO of Rocky Hill / Sequoyah Hills / South Knoxville can respond immediately to storm conditions in your neighborhood or around the country. As leaders in the water damage industry, we have hands-on experience helping business owners and residents recover after a major storm. We are here to help and here to serve. 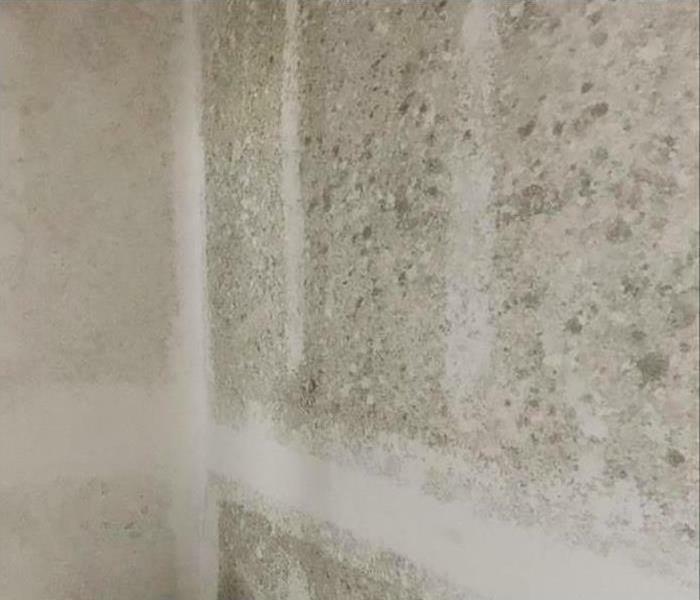 A vacant building in Rocky Hill, covered in mold because of heat and humidity, needed attention for mold removal and remediation. The non-salvageable walls and sections of the ceiling were demolished as the first step in the abatement service. Control of ambient air temperature and moisture levels are imperative to prevent mold infestations. We are proud to introduce the newest member of our local SERVPRO team, Mr. Finn Greenway. He specializes in mold and odor detecting. He's a hard worker and never stops retrieving tools for his team members. Finn says some days are ruff, but at the end of the day, it's all worth it. 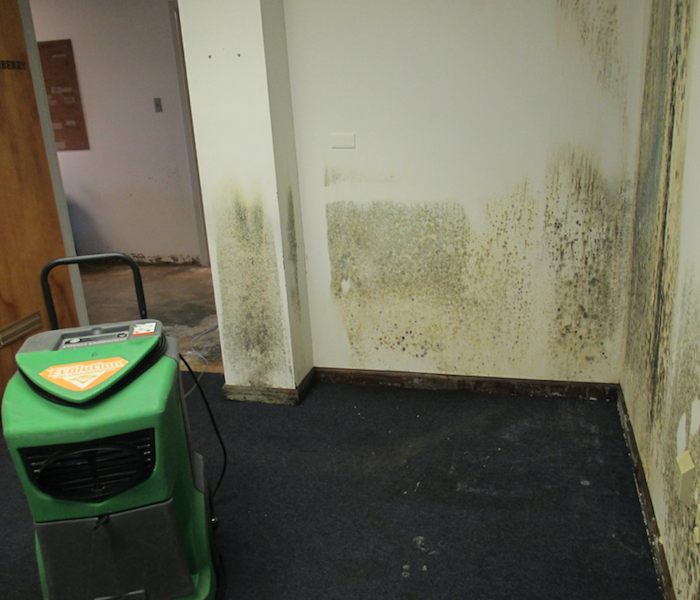 In addition to causing an interruption to your business, a mold problem can present a health risk for employees and customers exposed at your commercial property. 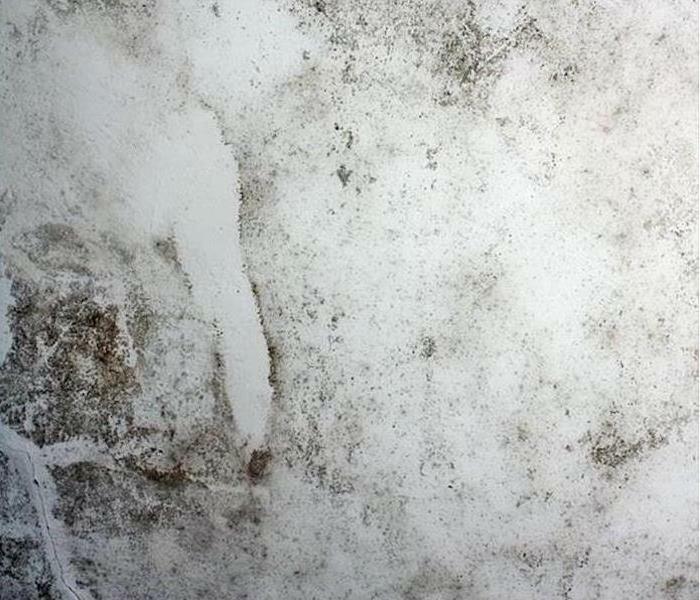 Mold can be caused by small water intrusions, like a slow roof leak or loose plumbing fitting. Call us (and Mr. Finn) for a fast response. 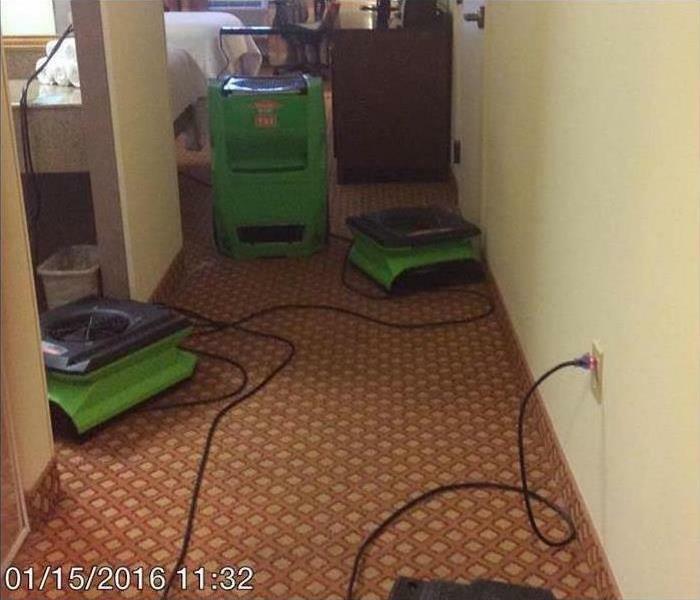 SERVPRO has the commercial and industrial grade equipment to grapple with any type of water damage to a business or residence. Drying and restoring an enterprise is only part of what we offer because We're Faster To Any Size Disaster. We get your doors reopened quickly to get back to business as usual. Water emergencies and floods don’t wait to occur during normal business hours, but neither do we. 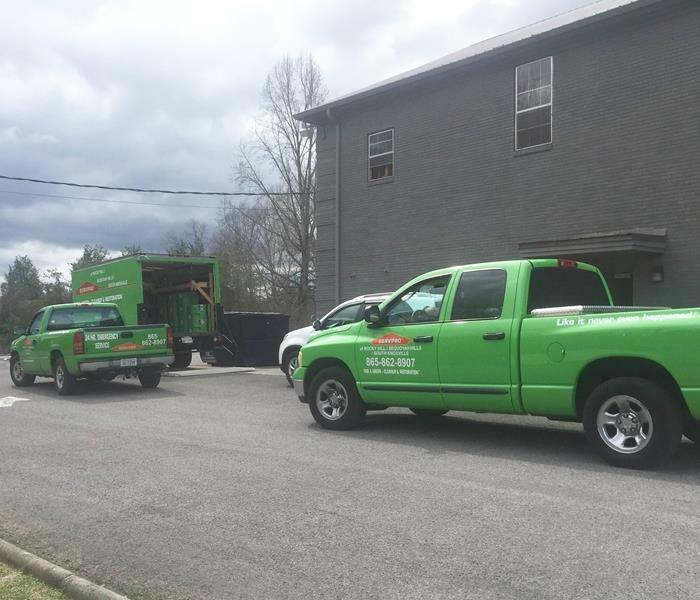 Our SERVPRO of Rocky Hill/Sequoyah Hills/South Knoxville team provides around the clock emergency cleaning and restoration services. We are available 24 hours a day, seven days a week, 365 days a year. You can always expect a quick response time, night or day. We are the company you know and trust! Our highly trained staff is ready to respond quickly to your property damage situation. 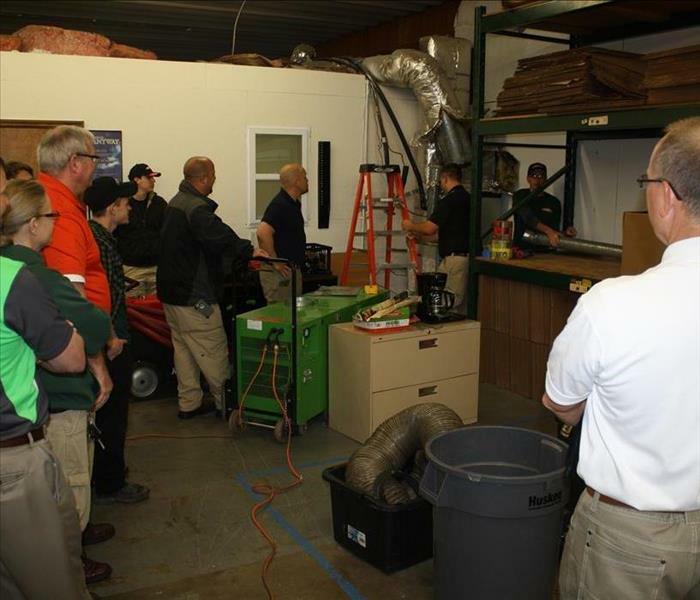 From initial training at SERVPRO’s Corporate Training Facility to regular IICRC industry certifications, you can be confidant that our team is has the knowledge and experience to restore your property. Our training program includes IICRC Training and Certification. The Institute of Inspection Cleaning and Restoration Certification (IICRC) certifies and sets the standards for the cleaning and restoration industries. Our local team of professionals study IICRC standards and best practices in water restoration, fire restoration, mold remediation, carpet and upholstery cleaning, and other cleaning and restoration courses. Weekly Training Meeting to Better Serve Our Customers. A recent storm brought massive amounts of hail and rain to the Knoxville area, that flooded this facility. 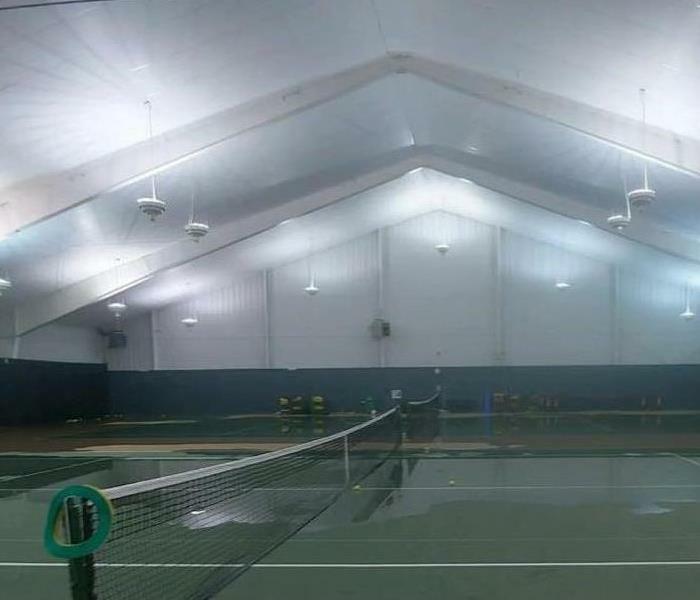 We pumped out over 8,000 gallons of water during the evening so no court times had to be cancelled the following morning. 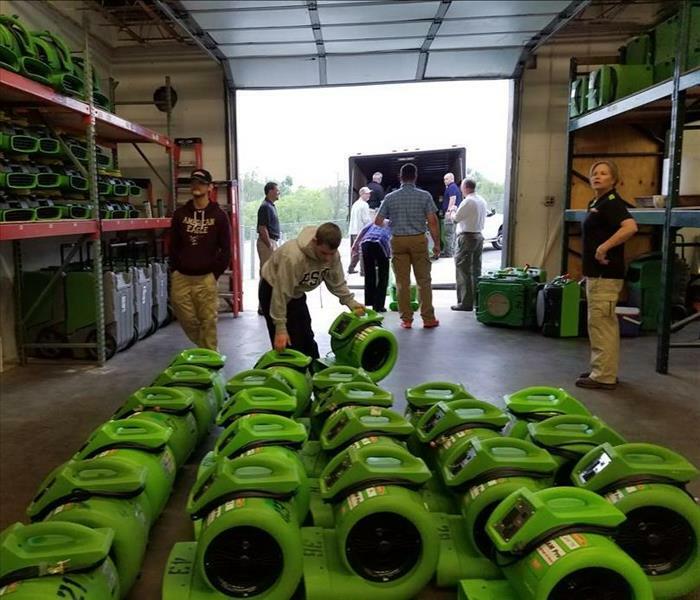 SERVPRO of Rocky Hill / Sequoyah Hills / South Knoxville has the training and equipment to handle large commercial flooding or water damage emergencies. When a storm or disaster strikes, we're here to help. Mold damage at this Rocky Hill home developed due to the relative humidity being consistently high in this room. If relative humidity is constantly above 45 percent the likelihood of mold developing is high. The mold infestation on this floor joist in a Rocky Hill crawl space is the result of excess moisture in this enclosed area. 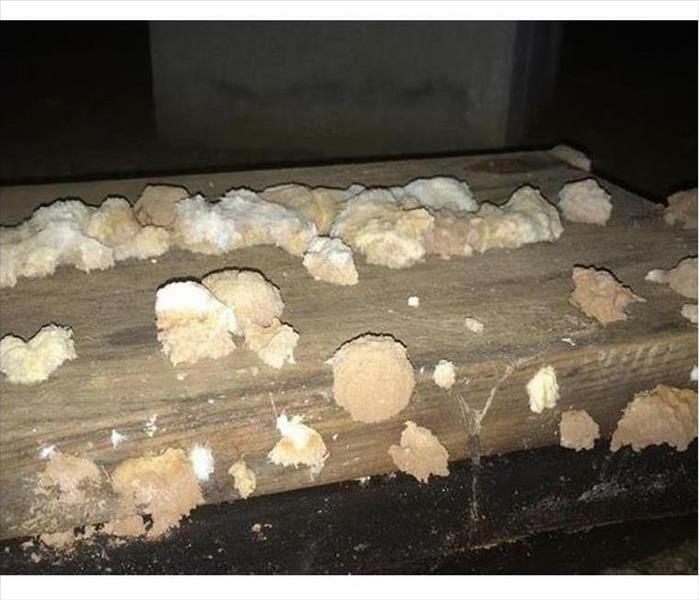 We scraped off the mold in several areas, fogged the entire crawl space with an antifungal chemical, and then put down a vapor barrier over the bare ground to limit the migration of moisture from the soil. 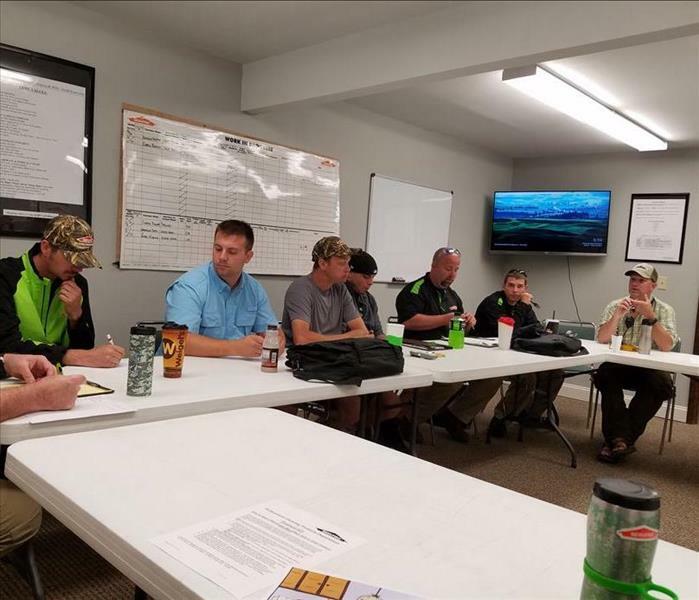 Our experienced fire team was invited by SERVPRO of Sevier, Jefferson & Cocke Counties to assist local residents and business owners recover from the Tennessee wildfires. 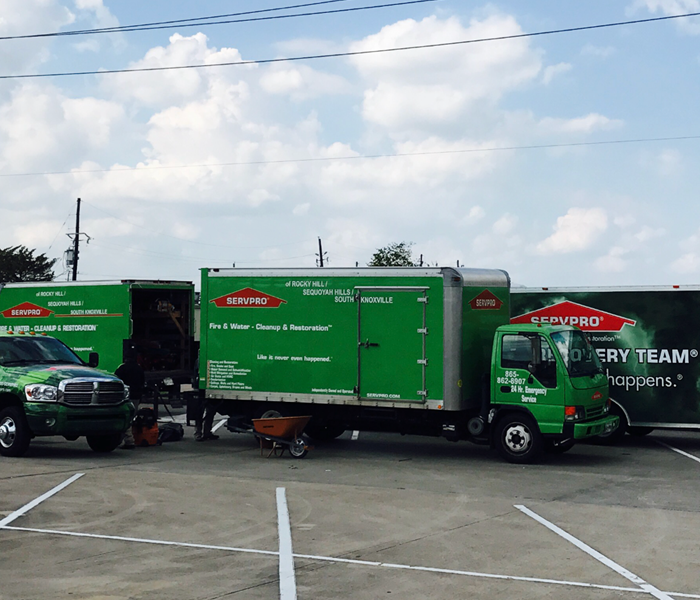 The SERVPRO Disaster Recovery Teams and Large Loss teams are here to help. Gatlinburg is hoping to begin the road to recovery this week as businesses start to reopen. Local emergency crews are trying to restore utilities and allow the city's roads to open. 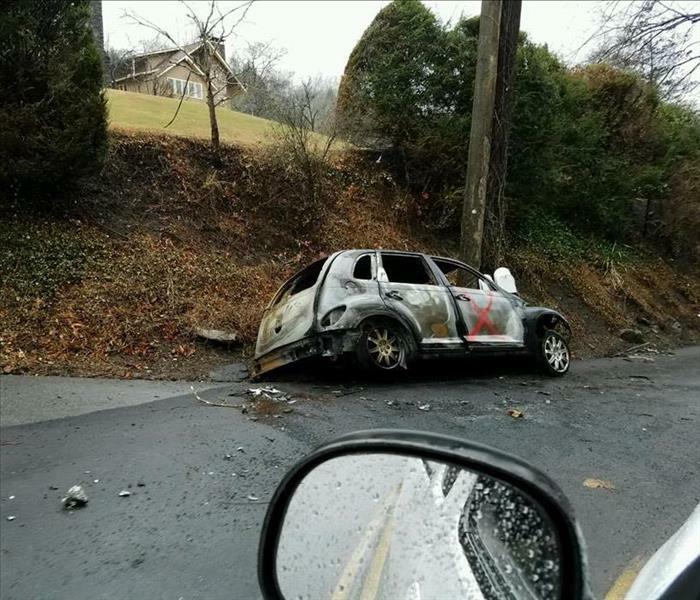 Gatlinburg residents started returning to evacuated areas of the city to find checkpoints for drivers, a curfew, limited access, and a boil water advisory that will remain until further notice. In your time of need, SERVPRO is a trusted leader in the fire restoration industry and we’re prepared to help you. 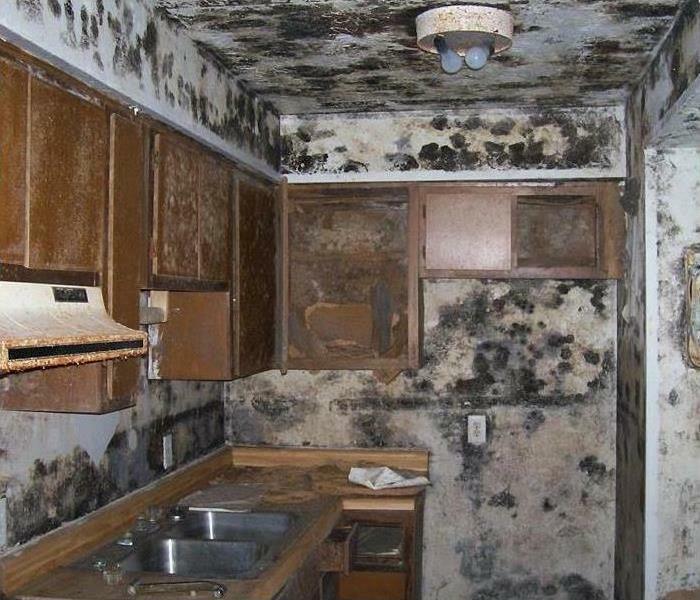 This picture shows an abandoned house that suffered severe mold infestations throughout the kitchen and an adjoining room. We had donned our HAZMAT clothing and gear before we started the demolition of these rooms. After tossing the cabinets, fixtures, and drywall down to the studs, we began the mold remediation with our equipment and products. Flames spread quickly through the Great Smoky Mountains and other Tennessee communities scorching hundreds of homes and businesses. Tourists and local residents had to outrun the blaze, which was pushed into the towns by wind gusts of nearly 90 mph. Drivers navigating narrow mountain roads raced to avoid the fires. Our heroic first responders fought the rough terrain as well as the intensity of the wind-whipped flames. Our Rocky Hill/Sequoyah Hills/South Knoxville team was invited to help after the wildfires by SERVPRO of Sevier, Jefferson & Cocke Counties. Together we are ready to assist our customers and neighbors to resolve any fire and smoke damage related to the wildfires. 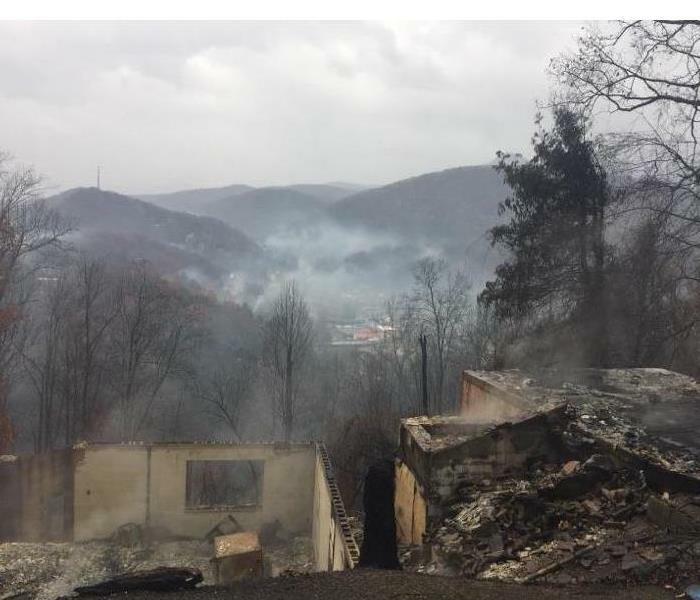 The team at SERVPRO of Rocky Hill / Sequoyah Hills / South Knoxville is in the Gatlinburg area to assist SERVPRO of Sevier, Jefferson & Cocke Counties with the aftermath of the recent wildfires. The wildfire quickly began to spread affecting The Great Smoky Mountains and other Tennessee communities. Business, vehicles, and homes have suffered severe fire damage. 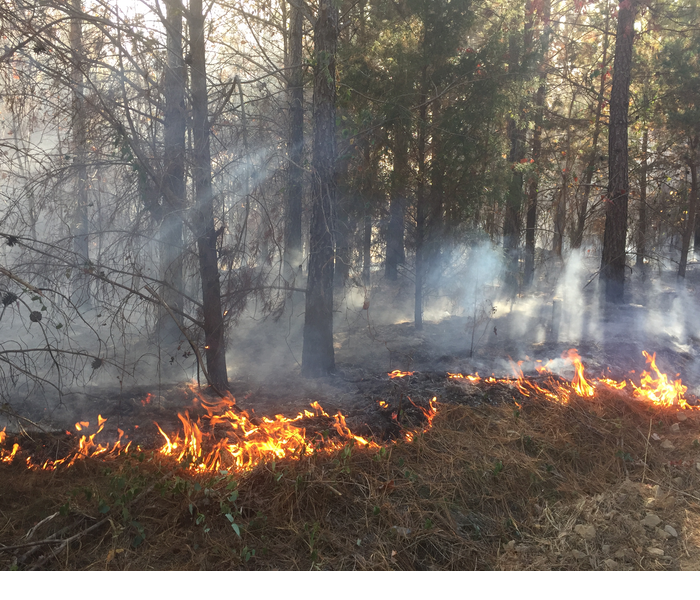 At SERVPRO of Rocky Hill / Sequoyah Hills / South Knoxville, we know dealing with a natural disaster like wildfires can be very stressful. Our technicians are trained for scenarios like this and will guide you through each step of the fire damage restoration process. Our SERVPRO family sends their thoughts and prayers to the victims, their families, and first responders. Please donate to support those who have lost so much. 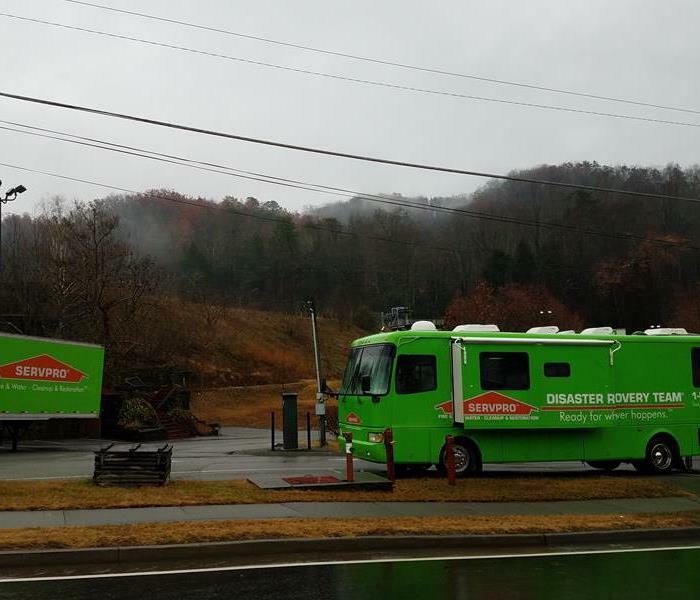 SERVPRO of Sevier, Jefferson & Cocke Counties invited our team to assist them after the Tennessee wildfires. You can count on SERVPRO for 24-hour emergency service. Our highly trained teams can respond quickly to your commercial or residential fire restoration situation. The Disaster Recovery Teams are here to help the local residents and business owners after the devastating wildfires. Trust the name you know and a leader in the restoration industry, trust SERVPRO to help you recover. It's that time of year when SERVPRO of Rocky Hill / Sequoyah Hills / South Knoxville receives calls about winter water damage. With specialized equipment like hygrometers and moisture detectors, our technicians can measure the amount of moisture in your Knoxville property. Water can be concealed behind ceilings and walls; our team uses infrared cameras to locate and eliminate the water. 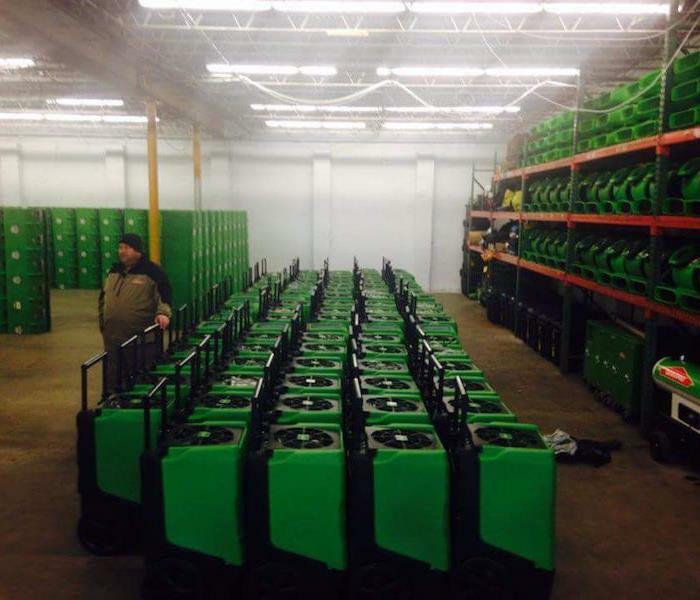 We dry out your property with industrial-grade dehumidifiers and High-speed air movers. Is your residential or commercial property ready for winter? This winter don't let frozen pipes or ice dams ruin your holiday, contact SERVPRO of Rocky Hill / Sequoyah Hills / South Knoxville regarding any winter water damage emergencies - (865) 862-8907. At SERVPRO of Rocky Hill / Sequoyah Hills / South Knoxville, we train for excellence. As the winter weather approaches, you’ll find you’re spending much more time indoors. Do you know … what is in your Air Ducts? Healthy air quality prevents sickness with employees and visitors. It is common for ventilation systems to be the biggest culprit in poor indoor air quality. 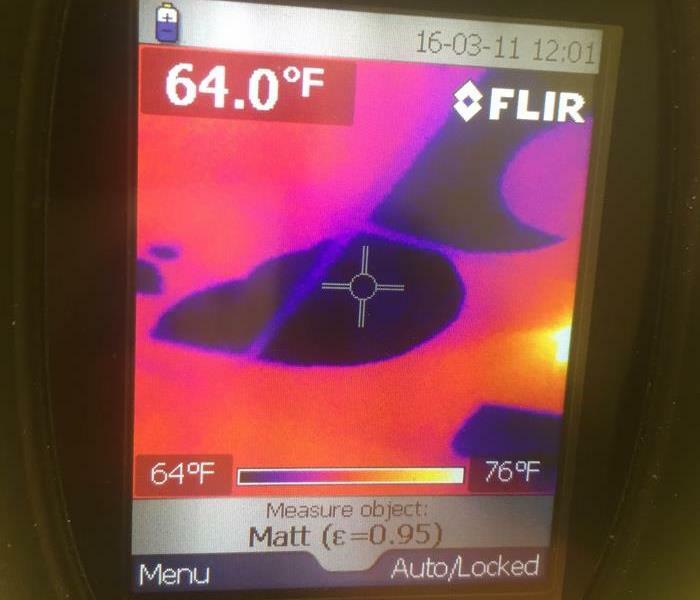 When was the last time someone inspected the ductwork in your business or home? You can trust our qualified team of professionals to do it right. In this photo, our team member Bryan Green teaches how to properly clean ducts. We will continue to offer ongoing training to our team of quality people in an effort to always provide our customers the most advanced cleaning options available. The water leaked from a supply line and dampened the commercial carpeting, which was glued down, in this Knoxville office. After suctioning off the water with a wet-vac, we set up a silicone gel dehumidifier to capture the remaining moisture in the carpet and air. The smaller air movers facilitated the circulation of the water molecules to hasten the drying process. Fast and efficient. Cold and Ice cracked this rain gutter in a Knoxville apartment building. The thawing ice, instead of channeling to the downspout, flowed down wetting the copper copula. The damage was extensive inside the unit because the facia board was breached and damaged a ceiling and a light fixture. For emergency service for your business building or home contact us for fast 24/7 service at (865) 862-8907. The team at SERVPRO of Rocky Hill / Sequoyah Hills / South Knoxville received a call about a residential property that had endured fire damage. Thanks to the quick action of our crew, we were able to begin the restoration process before any further damage occurred. We utilize specialized equipment and procedures to eliminate soot and smoke from all surfaces. Our technicians use fogging equipment and industrial air scrubbers to eradicate any odors left behind by smoke. If water is present, our experts will use air movers and dehumidifiers to extract the remaining water and finished the drying process. At SERVPRO of Rocky Hill / Sequoyah Hills / South Knoxville, we have a team of specialists that have the expertise and training to restore your commercial or residential property back to pre-fire condition. Pictured is a SERVPRO tech in his Personal Protective Equipment (PPE) as mandated by OSHA in severe mold damage remediation services. This Knoxville home was vacant and required extensive demolition before it could be rebuilt and sanitized. Our technician is removing the linoleum mold infested flooring during this service. 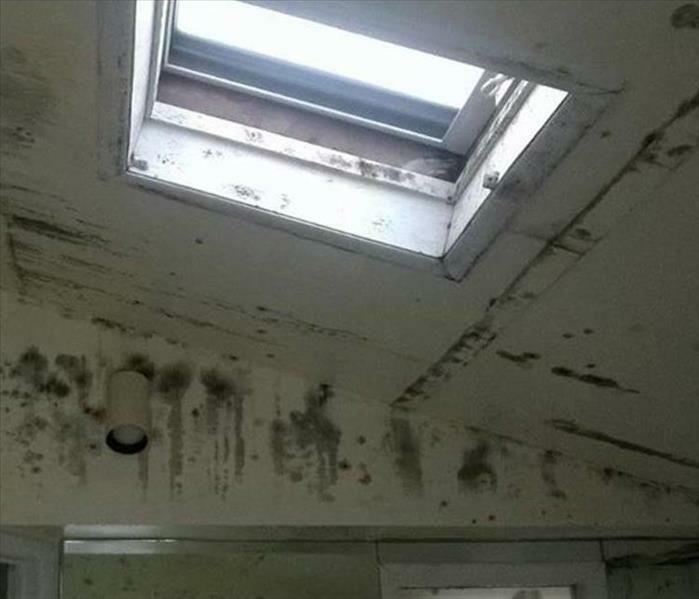 Count on the premier mold remediation company to return your home to its pre-loss condition, "Like it never even happened." Another example of a cigarette scorching a home. The fire was quickly put out, but the collection of vinyl albums deposited a coating of soot in this bedroom. Our SERVPRO used special dry sponge equipment to remove most of the soot and then focused on cleaning the soft fabrics in this room. The flat roof above this Knoxville office space did not keep out a heavy rainfall. The water accumulated in the ceiling tiles and finally collapsed onto the desk and cartons below. Our SERVPRO technicians responded promptly, covered the compromised roof area with a tarp to prevent more water intrusion and then proceeded to discard the ceiling tile debris. We protected the furniture, dried out the office with air movers and dehumidifiers and prepared the room for final restoration. "Like it never even happened." 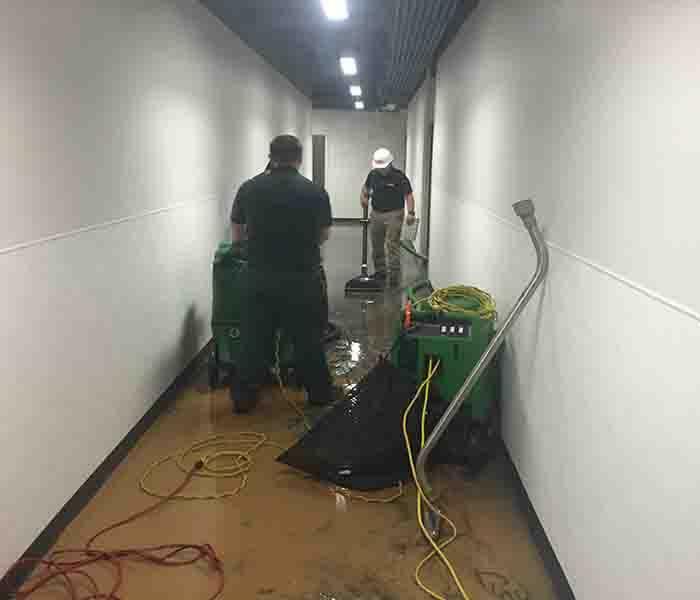 For commercial and residential rapid service to mitigate water damage call SERVPRO of Rocky Hill-Sequoyah Hills-South Knoxville at (865) 862-8907 for 24/7 emergency service. Mold damage at this Knoxville home pictured above permeated the entire basement of the structure. A complete tear out and replace was required.If you experience mold damage at your home, call SERVPRO of Rocky Hill / Sequoyah Hills / South Knoxville 24/7 at (865) 862-8907. There is never a good time for an emergency in your home; some days are worse than others. Please read the testimonial letter we recently received. Our client shared comments including 'Your team was kind, understanding and patient. They could not have been more helpful. We truly appreciate all that you did’. 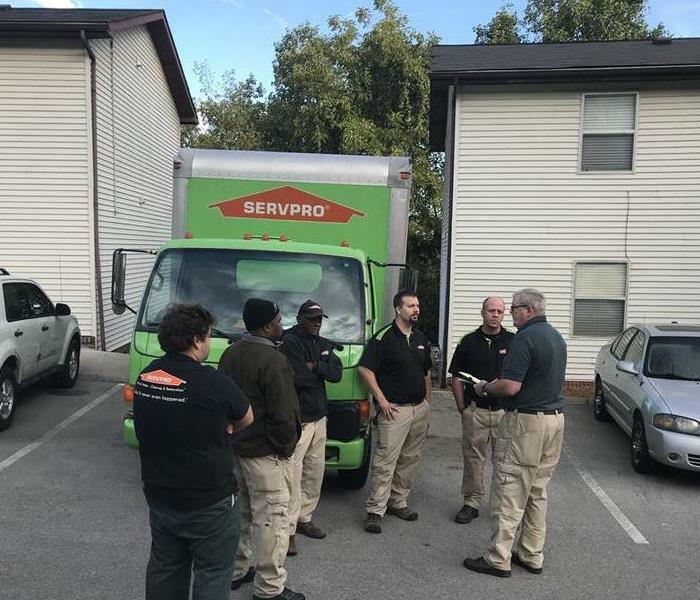 As a trusted leader for water, fire and mold damage restoration in the Knoxville area, our highly trained team at SERVPRO of Rocky Hill/Sequoyah Hills/South Knoxville is ready to help you also. Pictured here is the state-of-the-art Hardwood Mat Extractor. The rectangular mat, placed over a wetted hardwood floor, suctions water that is below the planks. 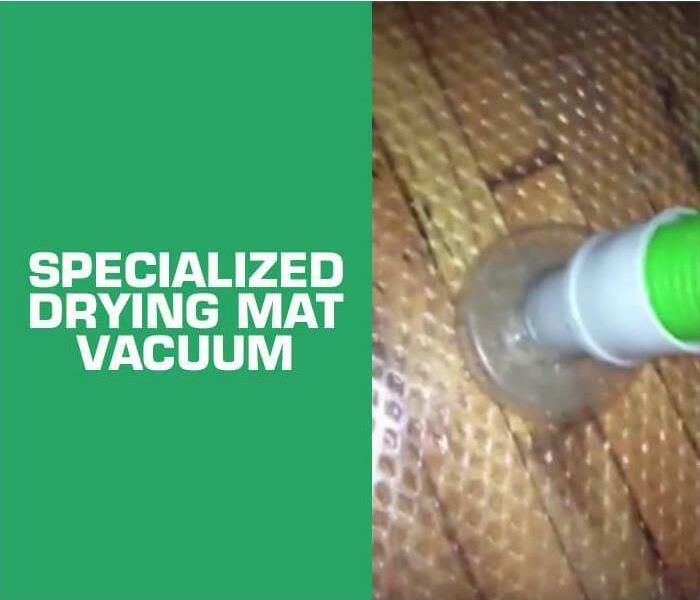 The high-powered vacuum draws the water and moisture from between the fitted seams in the flooring and channels it to a drain line. The slow leak from the ice-maker line accumulated into a puddle out of sight. If siphoned away fast enough, the hardwood flooring will not warp or cup and can be salvaged, making for a very satisfied customer. This also mitigates opportunist mold from establishing hidden colonies, leading to more inconvenience and expense. 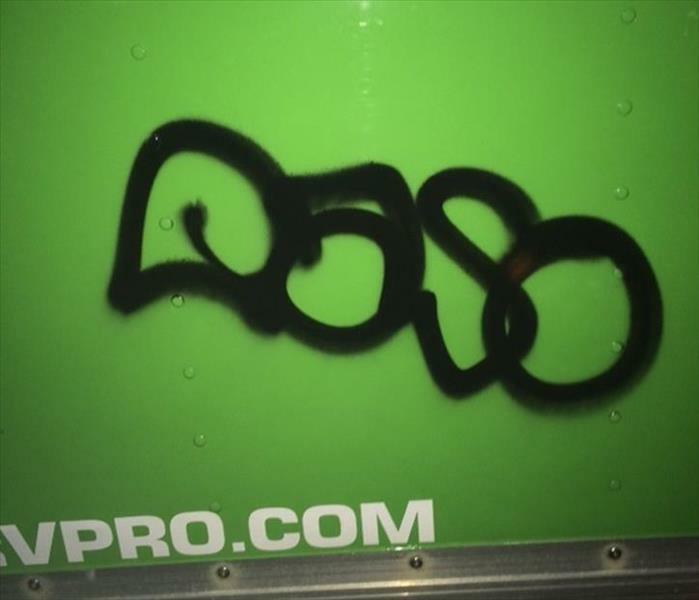 SERVPRO has qualified ASD and WRT personnel, backed up by experience and equipment, to restore water damaged material and possessions to pre-loss condition "Like it never even happened." Water damage Occurred from flooding in Downtown Knoxville. A massive amount of water accumulated requiring a matching response. As you see in this photo, the amount of equipment available to deal with flood damage allows us to attack any job of any size. Our customers can be assured that we will deal with their tragedy swiftly and efficiently. They can count on sufficient quantities of water removal equipment to extract water. Commercial air movers and dehumidification machines are available in abundance. If you have a water damage event from any cause, call SERVPRO of Rocky Hill - Sequoyah Hills - South Knoxville 24/7 at (865) 862-8907. "Helping Houston" has been a very rewarding experience for the team that drove down from SERVPRO of Rocky Hill/Sequoyah Hills/South Knoxville. This photo shows the deluge that covered an extended area of North Harris County. This golf course is adjacent to a subdivision called Bear Creek where over 262 homes suffered severe water damage from the flooding. The inset depicts water-logged building materials along the streets that were discarded. Our efforts of demolition and water removal bear fruit and give relief to the local homeowners, one house at a time. The Green Team is ready to meet up with our other emergency support vehicles and box truck. A major problem with flooding is the intrusion of contaminated water into the houses and basements. When this category 3 (Black Water) contacts the structure, it is imperative that water removal and drying be done as soon as possible. This will allow for the fast application of antimicrobial and antifungal agents to sanitize the property ensuring restoration to pre-loss condition. It looks like a long road ahead, but we will help to dry it out as we offer our assistance to return a sense of normalcy to the residents. The non-salvageable building materials, carpeting, and furniture are piled up on the roadside. Drywall must be gutted above the waterline to ensure the removal of contaminants from the water intrusion. We are removing 4-foot sections to conform to drywall re-installation. Even as we worked long hours through the week the floodwaters have receded. The drying, moisture removal, and sanitizing and disinfecting have helped to mitigate the flood damages and give hope to the locals. The SERVPRO Emergency Response Trailer is getting ready for the long trek home. 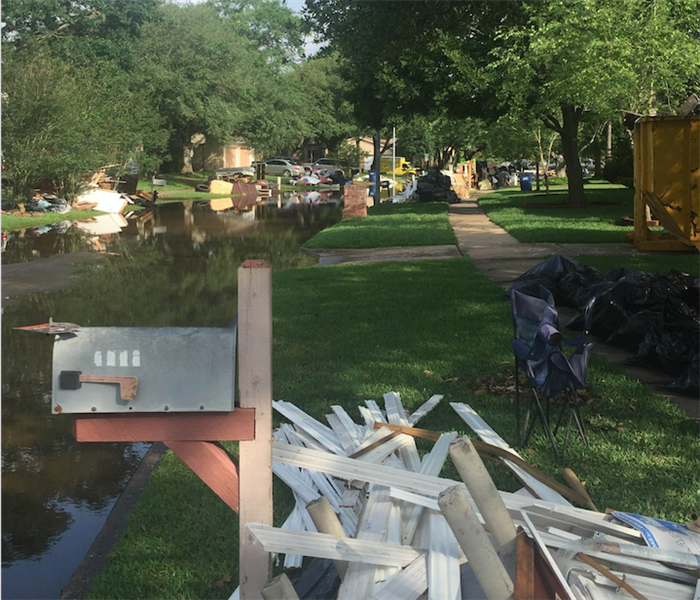 We have contributed to the "Help Houston" campaign and believe our efforts have alleviated some stress and saved the local homeowners some of their treasured possessions. 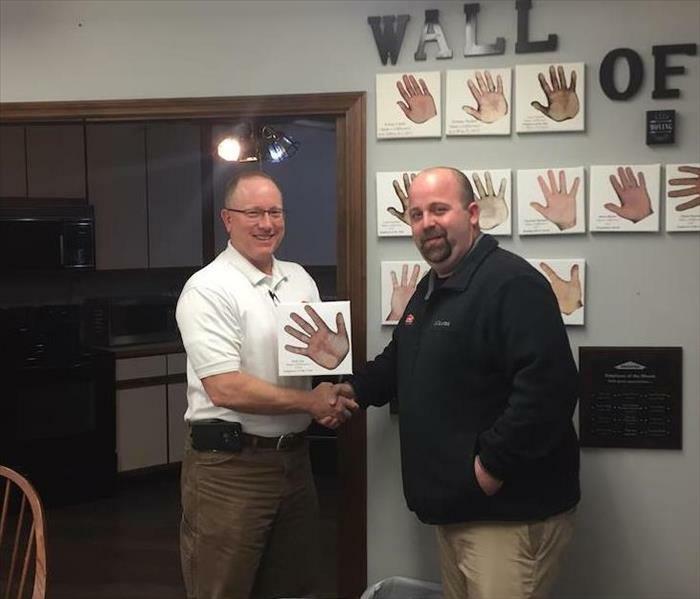 As quoted by the SERVPRO of Rocky Hill/Sequoyah Hills/ South Knoxville owner, Christina Greenway, "One of life's greatest privileges is to help others in their time of need." We are still doing our part to "Help Houston" with the aftermath of the historical flooding which inundated large swathes of land and buildings. Even after a week's time, large tracts of residential areas are still under water. Releasing water from the levies has been a careful process because of the fear of water backing up into homes. One of our SERVPRO of Rocky Hill/Sequoyah Hills/South Knoxville vehicles is helping to block off a heavily flooded area even as our storm team crew members are removing unwanted water from these local houses. Our IICRC certified technicians are striving to mitigate water damages and save and preserve as much as possible for the anxious residents. 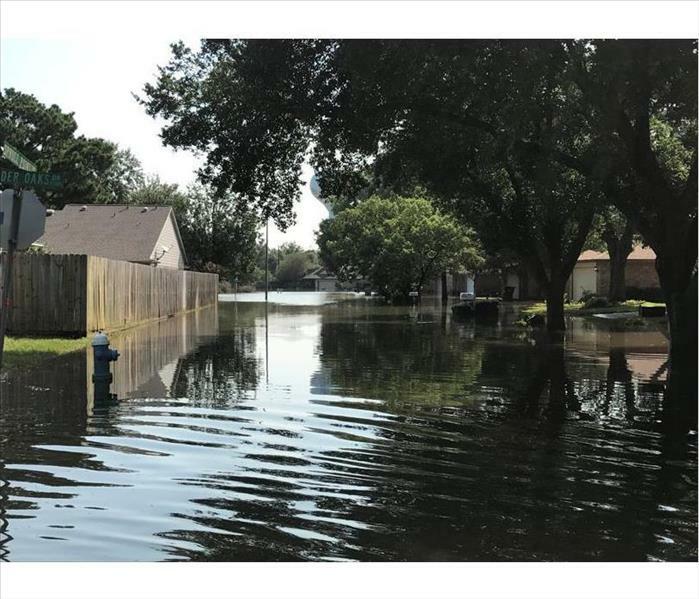 As the record rain and floods impacted the Houston TX area, we received a call asking if we were able to provide assistance to residents in Houston. 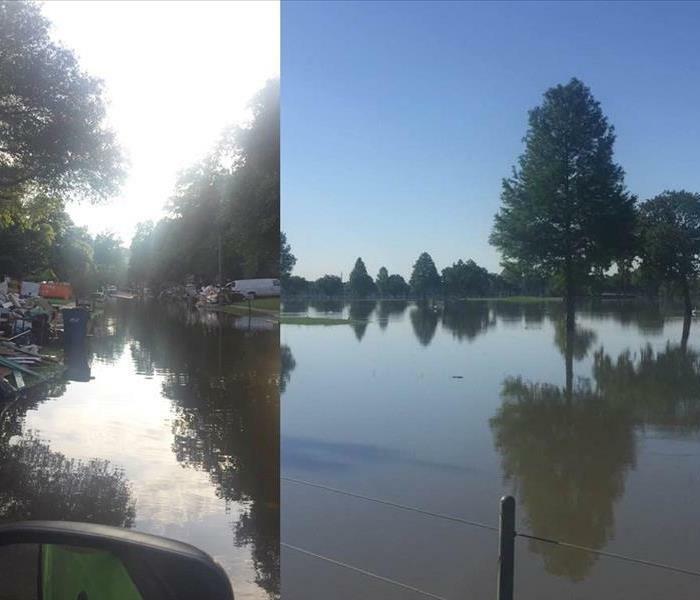 The historic flood water has left at least 1,000 residential homes swamped and many residents and businesses without power. Our Storm Team met in the morning to quickly debrief, load the trucks, and hit the road. Houston, help is on the way. Statistics prove that 50% of businesses go out of business when a disaster occurs. The key is, knowing who to call to get you back to business. Please keep the Houston community in your thoughts as they are dealing with this natural disaster and please say a prayer for our Storm Team to stay safe as they help to make a difference. "One of life's greatest privileges is to help others in their time of need.” said Kristina Greenway of SERVPRO of Rocky Hill/Sequoyah Hills/South Knoxville. Our storm troopers are heading to Houston to help recover from the recent flooding. Thousands of people are suffering with damage to their homes and businesses. Our team met in the morning prior to the long trip to Houston. We want to give a special thank you to our staff and crews at SERVPRO of Rocky Hill/Sequoyah Hills/South Knoxville. These men and women work extremely hard every day to get the job done quickly for our customers. They are all so talented in their field and we appreciate them. Some of the crew spent six weeks helping residents on the Jersey Shore after super storm Sandy. Don’t worry about us taking care of local customers while they’re away. We have 27 employees working at SERVPRO of Rocky Hill/Sequoyah Hills/South Knoxville. We can take care of ANY size water, fire or mold remediation project at your home or business. 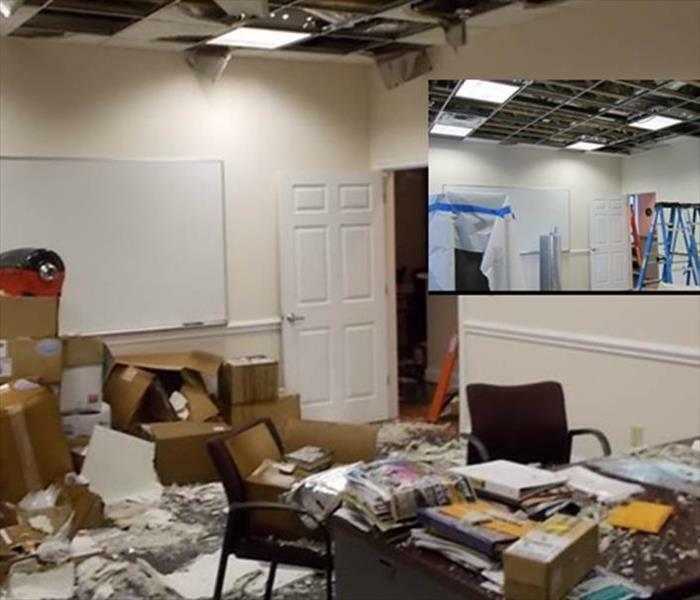 Commercial water damage in Rocky Hill can cause significant damage to your property. Recently a client called us when a twelve inch main water line broke and flooded three floors of their commercial building. Our highly trained professionals were onsite in ten minutes. Water damage comes in many different forms, our technicians will tailor the treatment method to the severity of the damage. With specialized techniques and equipment, our team can find water damage that may be very difficult to locate. Our specialists use relative humidity readings, room measurements and temperature to chose the number of dehumidifiers and air movers to dry your commercial property. 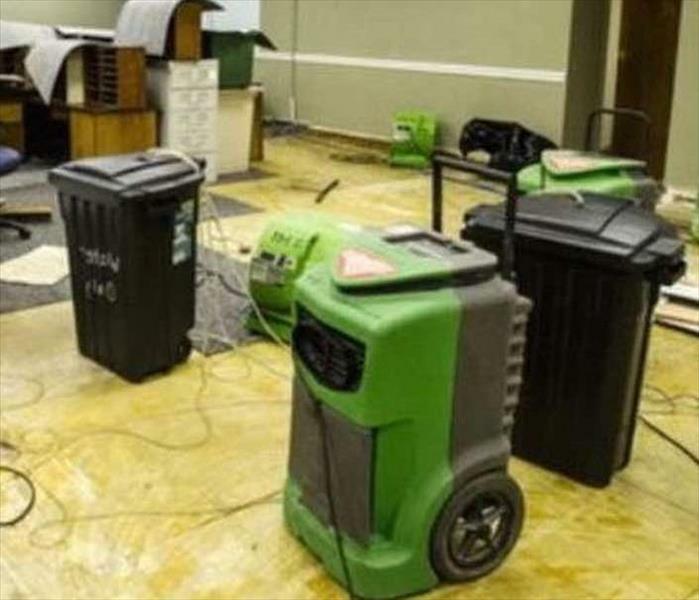 When your business is hit with water damage call a restoration company you can depend on, SERVPRO of Rocky Hill / Sequoyah Hills / South Knoxville . Our local team provides 24-hour emergency service to help get your business back to tip top condition after a water damage emergency. A fire broke out in this apartment complex building after the structure was hit by lightning in the Knoxville area. 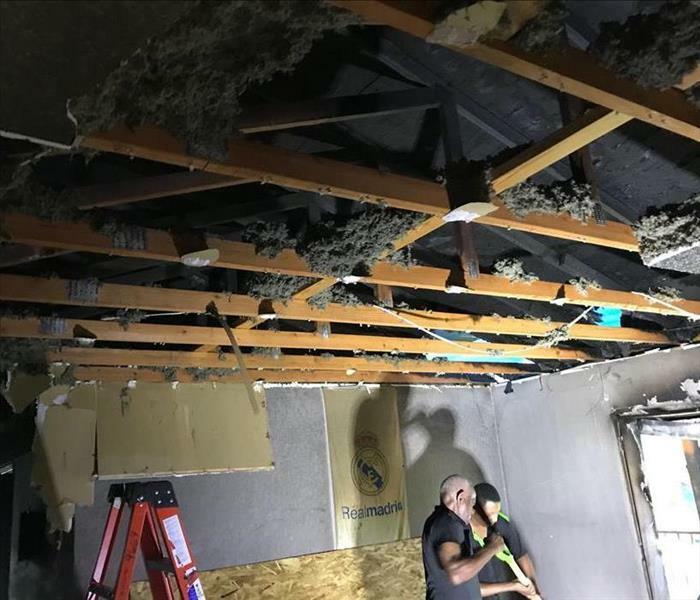 Our SERVPRO crews immediately responded and as soon as we arrived, we knew that our immediate concern was to secure the structure to prevent additional damage. Within a few hours, the building was boarded up. SERVPRO of Rocky Hill/Sequoyah Hills/South Knoxville can simplify the restoration process by treating the initial damage and rebuilding the damaged areas. We are ready to help you 24 hours a day, 7 seven days a week, 365 days a year. SERVPRO of Rocky Hill/Sequoyah Hills/S Knoxville has a heavy-duty, state-of-the-art "Drying Chamber for Document Recovery." Important documents, books and other items that have sustained water damage may require immediate drying to ensure restoration. Large-scale floods and water intrusion may need on-site action to limit water damage. The drying chamber can be truck-mounted, and transported quickly to your location in the Knoxville area. After quick freezing the unwanted moisture content, the pumps will reduce air pressure within the chamber. This reduction significantly reduces the drying time and this process can salvage even items you thought were unsalvageable. If you suffer a water damage event in the Rocky Hill area, call us for fast service. 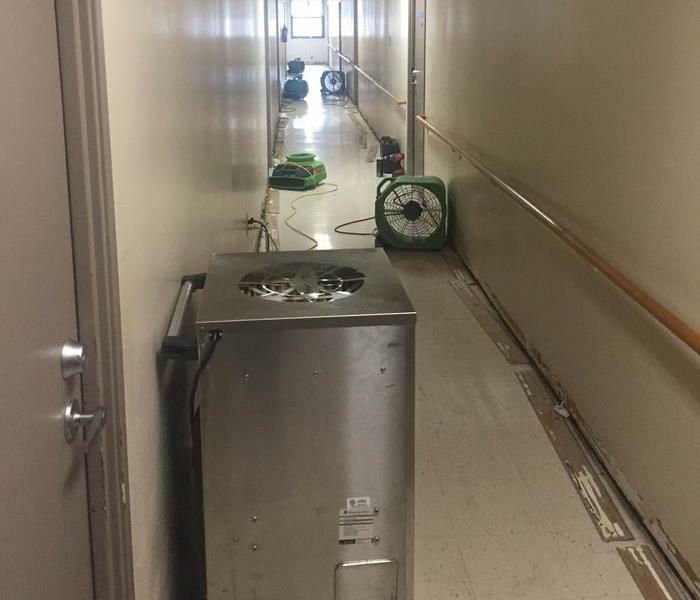 This Knoxville apartment building sustained water damage to the second-floor bathroom caused by a burst pipe. The property management company contacted us for emergency service and two SERVPRO pickups, and a well-equipped box truck arrived in 15 minutes. Portable extractors removed the pooling water from the bathroom as wet-vacs and mops removed the water from the first floor. Moisture detectors and meters indicated the water traveled down a narrow path, so our technicians identified the wet areas, set up drying devices, and then used thermal fogging to sanitize the wall voids. Our expertise in antimicrobial disinfecting and antifungal applications will mitigate the possibility of mold growth as we restore a safe environment to the apartment. "Like it never even happened." When you have a problem with water, mold or fire, call SERVPRO of Rocky Hill / Sequoyah Hills / South Knoxville for 24/7 service at (865) 862-8907. Sometimes in Rocky Hill and Bearden, a backed up sewer line, and a kitchen fire can occur simultaneously. Fortunately, our highly skilled technicians can rely on Chuck Peterson, our Operations Manager, to coordinate the jobs with Tim Visser, our Production Manager. 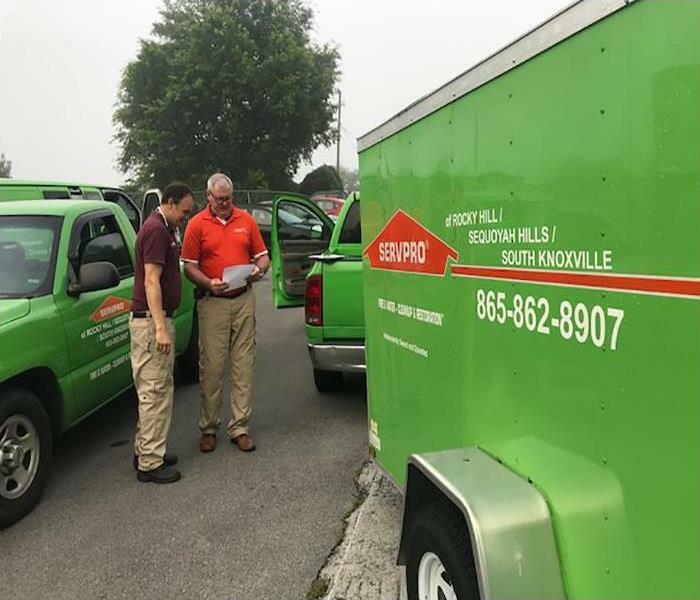 By constant communication and cooperation amongst our team members, SERVPRO of Rocky Hill / Sequoyah Hills / South Knoxville can reach out to many emergencies in the local communities that we proudly serve. So, don't hesitate to put your trust in us to resolve any problems from plumbing breaks or flare-ups. We will restore your property "Like it never even happened." We can dispatch a crew 24/7, just call (865) 862-8907. A residential home in Sequoyah Hills had water damage from a ruptured ice-maker line inside the wall. Since it was undetected for some time, the water had wicked laterally along the interior of the drywall onto adjacent walls. We used the pictured infrared heat detector device to help find hidden moisture pockets. "Infrared sees what the common eye cannot." Along with moisture meters and hygrometers, we successfully discovered all wetted areas for complete drying. SERVPRO of Rocky Hill / Sequoyah Hills / South Knoxville has advanced equipment for water extraction and drying, but equally important is restoring the home to its preloss condition by utilizing state-of-the-art moisture detectors. We can help with all of your mold, fire, and water-related problems by just calling us at (865) 862-8907. This is a massive desiccant dehumidifier we used at the Farragut building in downtown Knoxville, TN after a water damage restoration job. It literally pulls moisture out of a building. Amazing! Hi-Tech Drying Equipment Drying equipment helps prevent property water damage like swelling and warping of floors, walls and furniture. Industrial grade dehumidifiers minimize secondary water damage. High-speed air movers create airflow across walls, carpets, pads and furniture, evaporating moisture. Some situations call for special drying techniques that require state of the art equipment and training. Our technicians are highly trained and experienced with every water damage and cleaning scenario. Water Removal Equipment Moisture detectors, hygrometers and other meters measure the extent of moisture saturation. Infrared camera may be used to identify water location for thorough water removal. Submersible and gas-powered pumps are used for continuous pumping of high-level water. Truck mounted and portable extraction units perform efficient water removal. Sanitizing Agents, Germicides, & Anti-Microbial Treatments Deodorization products control odors from excessive moisture. Disinfection products stop the growth of bacteria, fungi, mildew, and other harmful microorganisms. Hi-Tech Drying Equipment Drying equipment helps prevent property water damage like swelling and warping of floors, walls and furniture. Industrial grade dehumidifiers minimize secondary water damage. High-speed air movers create airflow across walls, carpets, pads and furniture, evaporating moisture. Some situations call for special drying techniques that require state of the art equipment and training. This garage went up in flames and after the firemen left the work began. We took care of the resulting damage quickly and reasonable. 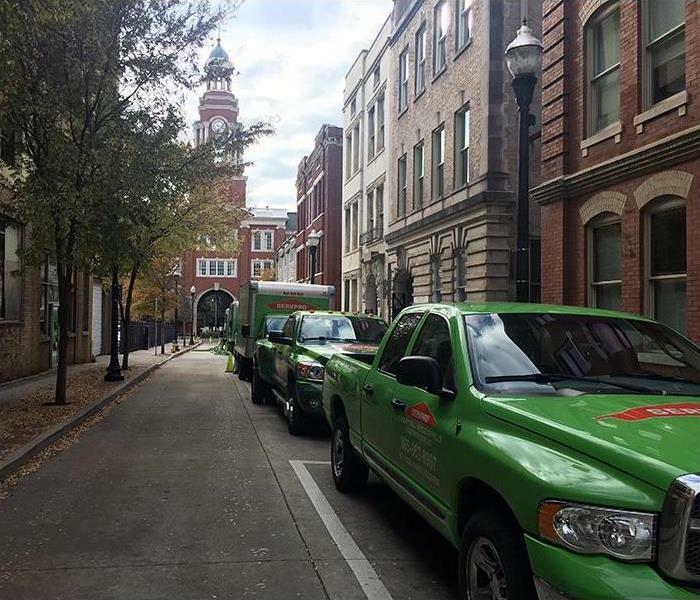 SERVPRO of Rocky Hill/Sequoyah Hills/South Knoxville proudly serves Knoxville- Knox County, Sequoyah Hills, South Knoxville, Rocky Hill, Downtown Knoxville markets - We are the Fire, Water, Mold, and Cleaning Experts - available 24 hours a day 7 days a week for your emergency. Experienced fire restoration professionals know that areas seemingly unaffected by Knoxville fire damage are still a danger to homeowners. Smoke can penetrate within cavities of the structure, causing hidden damage and odor. The knowledge fire restoration professionals have of building systems helps them investigate how far fire and smoke damage may have spread.